Missing teeth cause a variety of serious problems for adults of all ages, negatively impacting the ability to eat, speak, and smile with comfort and confidence. Until recently, patients had limited options to replace missing teeth and no solutions to replace missing tooth roots. Fortunately, Dr. Wagner offers a restorative solution that replaces both the root and the crown of the tooth in a way that looks and feels completely natural: dental implants. Dental implants represent the most advanced treatment available to date. 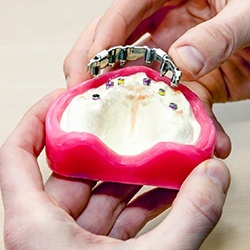 A tiny titanium anchor placed in the jawbone serves as a tooth root, and a natural-looking crown, bridge, or denture attaches to the root for a lifelike restoration with unrivaled support and function. Dr. Wagner brought in a Periodontal / Implant Specialist, Dr. Brian Young, to be a part of the ECCELLA team. This is unique compared to most general practices around the country. As a result, you can receive specialized care – including the surgical placement of your implants and their final restorations – in one convenient location. Many of these procedures can be extremely complex. For your comfort and to relieve anxiety, we offer I.V. Sedation (twilight) so your experience is 1000% comfortable. To "raise the bar" and make sure our procedures are exact, we utilize Cone Beam CT technology that allows exact 3D planning for the placement of implants. Very few offices offer this technology and level of experience not only surgically, but restoratively. Dental implants offer many benefits over traditional bridges, partials, and dentures. Dental implants are the only solution that does not rely on healthy, neighboring teeth for support. Because they’re anchored in the jawbone, dental implants do not jeopardize neighboring teeth, and they stimulate healthy bone growth. In addition, dental implants are designed to last a lifetime, whereas bridges, partials, and dentures often need to be replaced every 7-10 years. Dental implants are widely regarded for their strength, longevity, and aesthetic appeal. No one will be able to tell that you ever suffered from missing teeth, and you’ll be able to eat your favorite foods without the worries commonly associated with dentures. Because of their versatility, dental implants can be used to secure a single crown, a bridge, or a full arch of replacement teeth. You’ll love the freedom that comes with total tooth replacement and, perhaps most of all, you’ll enjoy the full benefits that come with a radiant, complete smile. Dental implants are extremely versatile. Dr. Wagner can use them to replace a single missing tooth, several missing teeth scattered throughout a smile, or to anchor a complete or hybrid denture. Many types of implants are available to accommodate your jaw shape and specific needs. Dr. Wagner works closely with our periodontal specialist, Dr. Brian Young, to ensure the success of your treatment. After reviewing your medical history and performing a comprehensive exam, Dr. Wagner and Dr. Young can verify the best course of action in your case. There are very few offices that offer this team approach - in office. Usually you have to be referred out to a specialist's office... then you have another exam, then you wait for the doctors to talk and confirm a plan, then they mail a plan to you or schedule another visit. Dr. Wagner specifically build ECCELLA to have an implant surgeon to be part of the team. Communication barries are eliminated, real-time discussions about the best treatment options are presented and there is time for the entire team to be involved all at one time. Q&A at its finest! Our team is proud to be able to offer the entire dental implant procedure right here in-office, including surgical implant placement and several quality options for the customized restoration of those implants. Whatever your needs are, we will meet and exceed them with flying colors. 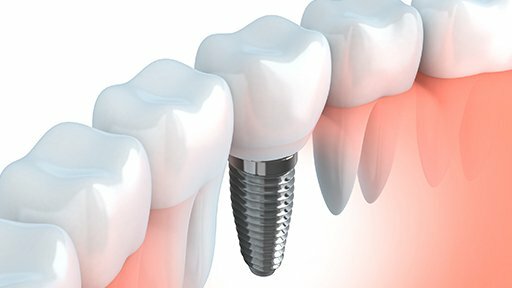 Single Tooth Replacement – For individual implants, a metal-free dental crown is the ideal restoration of choice. The placement of the crown will not require any significant, negative alteration of surrounding natural teeth, which is ideal for your ongoing oral health. Better yet, our team can design, mill, and place a new crown over the singular implant in the span of a single, convenient appointment with the power of CEREC technology. Implant-Retained Bridges – Implant-retained bridges are very similar to a traditional bridge in appearance and structure, and they are designed to replace multiple, consecutive missing teeth. One implant is placed in the jawbone for each individual tooth, and the use of a bridge helps to reduce the pressure on each implant and spread it more evenly along the restoration for a more comfortable and functional result. Implant-retained bridges are highly recommended because, unlike traditional bridges, they don’t require healthy teeth to be shaven down to accommodate their placement. Overdentures – Overdentures are full or partial prosthetics that are anchored in place by multiple dental implants. Unlike their traditional counterparts, they are designed to be permanent and non-removable within the mouth. This stable fit can improve your facial features and promote better digestive habits while also preserving your ongoing oral health to a greater degree. Hybrid Dentures – Hybrid dentures are often a good reconstructive option for patients who are unable to have dental implants successfully placed in certain areas of the mouth because of jawbone deterioration. This type of prosthetic combines the anchoring power of implants with the reliable coverage of a denture, eliminating the slippage and discomfort of a traditional model. They only require a few dental implants to be placed in order to secure the patient’s new teeth, making recovery much swifter. Today, our hybrids are made of the newest antibacterial, uber strong, exceptionally beautiful zirconia. We work with one of only 5 labs in the United States that have the "pic" camera which offers the highest level of digital impressions that seamlessly integrates with our 3D X-Rays, allowing for precission never before met in Jacksonville. Perfect fit and digital planning allows us to have exeptional results. Fountain of Youth Dentures™ with Implant Retention – Here in Jacksonville, patients will be happy to know that we can marry brand-new Fountain of Youth Dentures™ with implants to create an optimal smile restoration. These prosthetics are carefully designed to be a precise match for your unique mouth, providing exceptional comfort and rejuvenating cosmetic benefits that can shave years off your appearance.